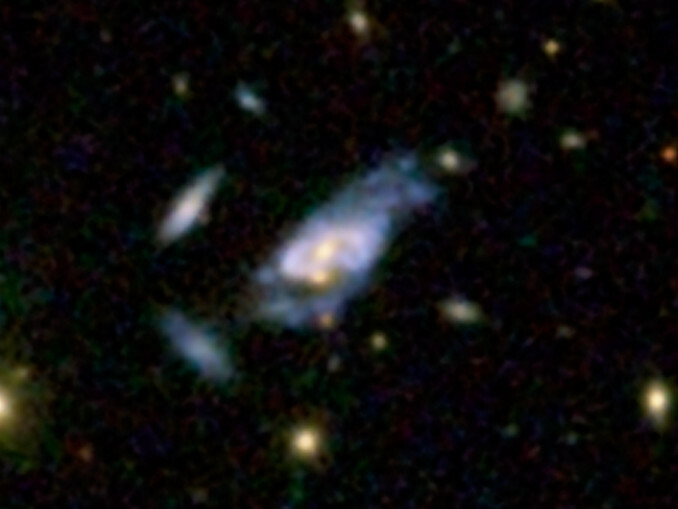 A huge galaxy with the moniker SDSS J094700.08+254045.7 stands as one of the biggest and brightest super spirals. The mega-galaxy’s starry diss and spiral arms stretch about 320,000 light-years across, or more than three times the breadth of the Milky Way. 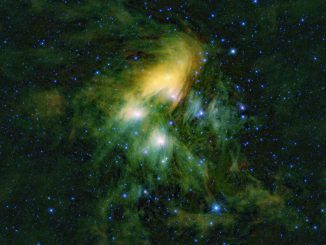 Image credit: SDSS. This super spiral, catalogued as 2MASX J08542169+0449308, contains two galactic nuclei, instead of just the usual one, and thus looks like two eggs frying in a pan. Image credit: SDSS. Ogle, Helou and their colleagues expected that humongous, mature galaxies called ellipticals — so named for their rugby ball-like shapes — would dominate their search within NED for the most luminous galaxies. But a tremendous surprise lay in store for the scientists. Super spirals can shine with anywhere from eight to 14 times the brightness of the Milky Way. 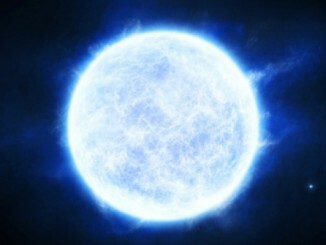 They possess as much as 10 times our galaxy’s mass. Their gleaming, starry discs stretch from twice to even four times the width of the Milky Way galaxy’s approximately 100,000 light-year-wide disc, with the largest super spiral spanning a whopping 440,000 light-years. Super spirals also give off copious ultraviolet and mid-infrared light, signifying a breakneck pace of churning out new stars. 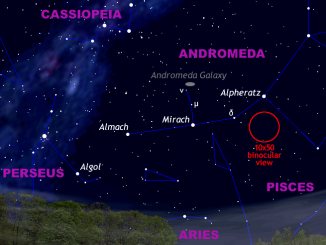 Their star formation rate is as high as 30 times that of our own run-of-the-mill galaxy. 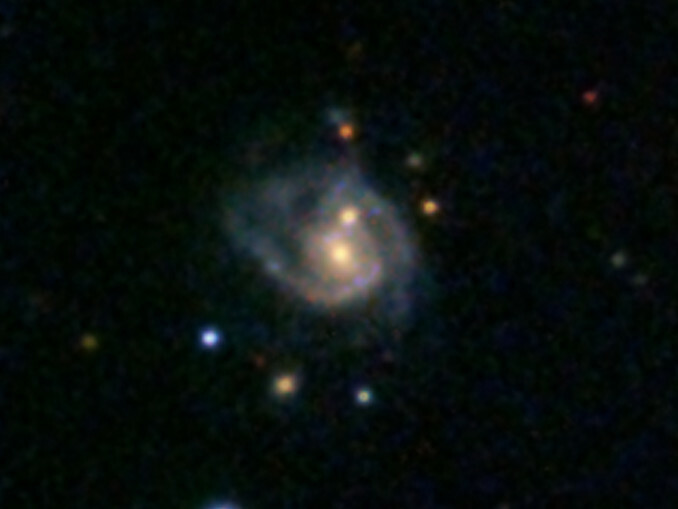 This image shows a super spiral designated 2MASX J16014061+2718161, and it also contains the double nuclei. Image credit: SDSS. 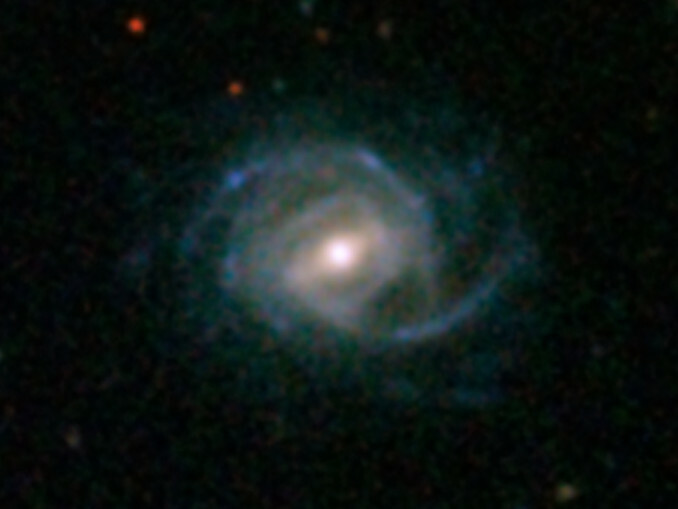 A vital hint about the potential origin of super spirals is that four out of the 53 seen by Ogle and colleagues clearly contain two galactic nuclei, instead of just one as usual. Double nuclei, which look like two egg yolks frying in a pan, are a telltale sign of two galaxies having just merged together. Conventionally, mergers of spiral galaxies are destined to become bloated, elliptical galaxies. Yet Ogle and colleagues speculate that a special merger involving two, gas-rich spiral galaxies could see their pooled gases settle down into a new, larger stellar disc — presto, a super spiral.